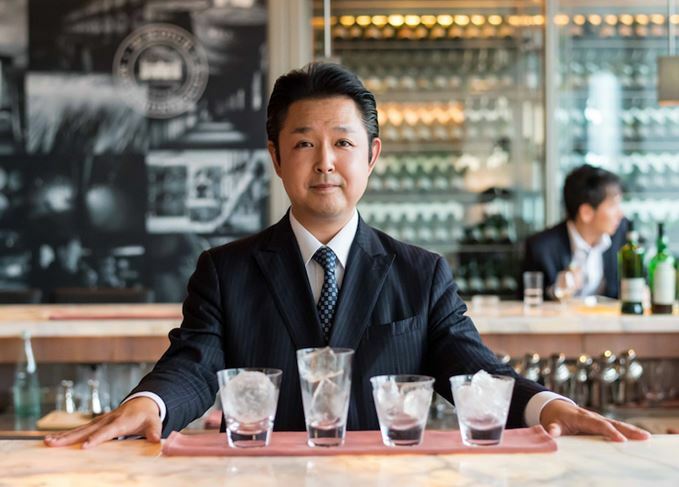 Dave Broom talks to acclaimed Tokyo bartender Takayuki Suzuki about the challenges of working with Scotch whisky in cocktails – and how the spirit differs from its Japanese cousin. I was sitting chatting with Takayuki Suzuki, cocktail director at Tokyo’s wonderful Park Hotel, a residence which has slowly transformed itself into a contemporary art gallery – all of the rooms on the 31st floor are designed and decorated by artists, the rest all feature art works on some wall; mine had an overflowing martini glass. As well as a place to rest your head in not inconsiderable comfort and style, it also happens to be the Tokyo members’ room for the Scotch Malt Whisky Society and, as such, the hotel of choice for most members of the Scotch industry. We’d been chatting about the Japanese approach to bartending and how it goes beyond mere technique (which is what most people are blinded by on their first few visits) or ice carving. Ice, as he explained, is an active ingredient in the drink. The ice ball which many UK bartenders are placing into their whisky serves isn’t there for show, but has been chosen specifically because this is a whisky which needs to be chilled and have very gentle dilution. There’s more, which taps into (if you pardon the pun) the Japanese reverence for water. ‘Snow falls on the mountains and goes into the rivers,’ he says, ‘that helps feed the people. The rivers then flow into the sea which also feeds us. We must have respect for the purity of the water because it keeps us alive. ‘Ice is a way of celebrating this. The ice ball is also then like a stone on a river bank worn down by water – or, in this case, whisky, which is then a celebration of time passing.’ Yes, it’s deep. He also rejects the idea that a Scotch cocktail – Rob Roy, or Blood & Sand, or Penicillin – can be made with any brand as long as it is Scotch. ‘I have to respect the whisky and know about it in advance,’ he says. ‘I have to respect the people who made it as well. ‘That means I need to find a reason why I should mix with this whisky, which in turn means I can then explain to the customer why it has been chosen, and why I’ve picked the flavours for this specific drink.’ That necessitates deep tasting. ‘In a peaty whisky the flavour is very strong,’ he continues, ‘but, behind that, other flavours are in place, so I have to focus on everything but peat and pick out the scents which lie behind. I can imagine a Scotch drink, but it would need two or three hours to understand the whisky. With Japanese whisky I can imagine the drink more directly. This doesn’t just apply to bartenders, I feel, but to anyone tasting and appreciating whisky. It needs time, its complexities need to be patiently examined, the balance revealed, and it is that complexity which Suzuki finds most challenging when mixing with Scotch. So is it easier, I ask, just to have Scotch neat, or with an ice ball, or water? ‘Often yes, if you don’t wish to spend time understanding it. Bartenders named the blended malt as the world’s best-selling and trendiest Scotch. The range of ready-to-drink cocktails is inspired by 19th-century merchant Ebenezer Connal.